Are you a fan of Rihanna? Well, I am; especially with her consecutive hit singles like What’s my name, Rude Boy, and Only Girl in the World. This bad Girl is making it big! Not only is she creating a big impact on other people like Willow Smith in reference to Style, she is also starting to create a trend in fashion and make-up. So here is my take on her look! It’s flashy, glamorous, and BAD. I hope you enjoy the tutorial and don’t forget to check out my Youtube channel and subscribe! Prep your face with the foundation primer, foundation, concealer, finishing powder, and eyebrow liner. Apply Ever Bilena Advance Smooth eyes cream eyeshadow in Champagne all over your lids including the inner corners of your eyes all the way to the upper part of your nose. This will hold the eyeshadows better and help enhance the colors. With a flat brush, apply the beige yellow eyeshadow from the lancome palette all over your lids, staying under your crease area. Include the inner corners of your eyes and the upper part of the side of the nose. With a dome-shaped brush get the coral eyeshadow from the Fashion 21 palette and apply it a little higher than your creasesocket bone and create an outer V on the outer corner of your eyes. This will create an almond-shaped eye. 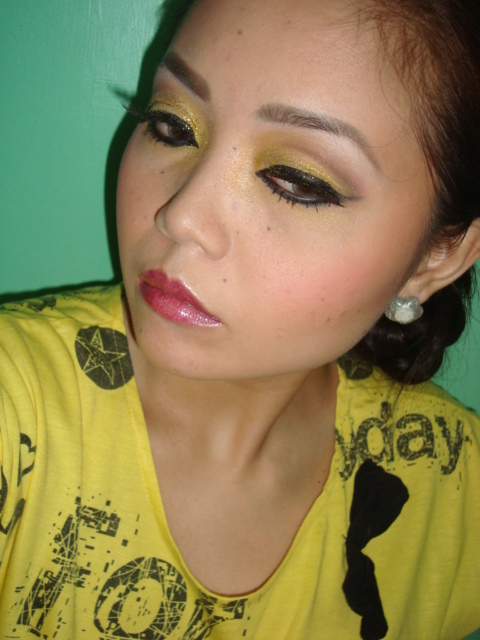 From the same palette, use the brown shadow and deepen the crease. Use a clean brush and blend the colors. Using the dark brown eyeshadow from the same palette, line the lower edge of the crease you just made to give more depth and to create a gradient effect. Using the same flat brush you used earlier, apply the yellow shadow from the palette over the beige yellow, emphasizing the yellow since it’s the highlight of the look. 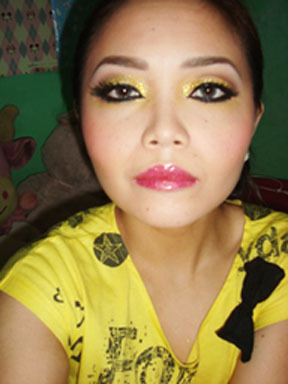 Using lash glue, apply some on top of the yellow and then press the gold glitters with a flat brush. Using eye drops, mix it with the glitters and pat on top of the yellow. line your upper lashline. 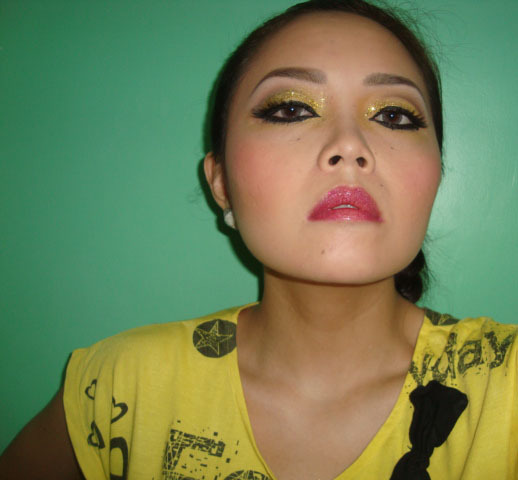 Exaggerate the line and create a flick on the inner and outer corners of the eye to attain a “Cat eye” effect. Line the upper and lower waterline with a black kohl pencil. apply black eyeshadow on top of the liner to hide the harsh lines. extend the show a little beyond the outer flick. apply matte white on the brow bone and upper part of the inner corners of the eyes. use the same dark brown you used earlier and apply it on the outer corner of your lower lash line just below the black liner. Curl your lashes and apply mascara and fake lashes. Contour your face, exaggerate your cheeks. Apply hot pink bluch on the apples of the cheeks all the way to the temples. apply Lip gloss in Orchid and then the glitter gloss in Fuchsia Pink.